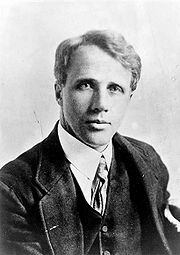 Look up Robert Frost's poems on the Internet. You will enjoy them. In many of his poems, Frost seems to be describing a concrete scene or experience, but at the end, the reader realizes that he has been aiming at something larger – he wants to tell us a universal truth about the human experience. This is also true of his poem “One step Backward Taken”. Here he tells us that we can often save ourselves by taking a step backwards, by looking carefully at what has been happening and by avoiding going over the edge. If we take Frost's backward step, and look at what has been happening since the start of the Industrial Revolution, we realize that many of the enormous changes that industrialism produced have been good. But other changes have been disastrous, for example colonialism, the destruction of the global environment, the dominance of unregulated financial institutions, the power of the military-industrial complex, and the undermining of democratic institutions. Can we not save ourselves by taking a backward step from these catastrophic developments? Right now, there is a particular precipice towards which humanity seems to be rushing – the threat of a third world war triggered by an Israeli attack on Iran. We read that the government of Israel, under Benjamin Netanyahu, is planning a unilateral military attack on Iran, and that it will take place in the autumn, at the height of the US presidential election. We read that Obama says on behalf of the United States, that if Israel is attacked by Iran, “all options are on the table”, diplospeak for US military involvement in the war. (But if Iran is attacked by Israel, how can Iran fail to respond?) We read that Russia is preparing for the threatened war by massing its troops and supplies in Armenia, and that China too may be drawn into the conflict. The Middle East is already a deeply troubled region, in which the United States and Israel can hardly be said to be universally popular. If Israel attacks Iran and the US becomes involved, what will be the response of the Islamic world, especially Pakistan, a country that possesses nuclear weapons? A new war in the Middle East, a war whose epicenter would be the Strait of Hormuz, would lead to an unprecedented increase in the price of oil. The world is already experiencing a serious financial crisis, and if the price of oil were to go through the roof, economies throughout the world would spiral down in a way that would make Black Thursday, 1929, look like a kindergarten picnic. Remember also that the US is already many trillions of dollars in debt because of its present wars. It is doubtful whether Israel, a country with 300 nuclear weapons, would benefit in any way by attacking Iran on the pretext that Iran might soon be in a position to produce two or three bombs of its own. Iran has denied that it wants to produce such weapons, but an attack by Israel might push the Iranian government into militarization of its civilian nuclear power program. And why does the US government act like a slave of Israel (as it has been doing for many years)? It is not at all in America's interest to become involved in a war with Iran, a war might escalate in a completely unforeseeable way. Let us take a step backward and save ourselves from going over this precipice. 1. Robert Frost, “Collected Poems of Robert Frost”, Holt, New York, (1930). 2. James Risen, “Secrets of History: The C.I.A. In Iran” The New York Times, April 16, (2000). 3. K. Roosevelt, “Countercoup: The Struggle for Control of Iran”, McGraw-Hill, New York, (1979).